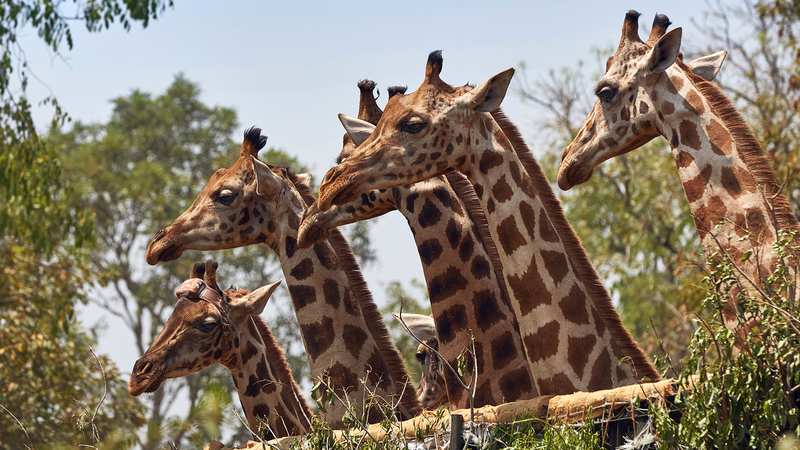 About 1,250 endangered Rothchild’s giraffes live north of the Nile River in Uganda’s Murchison Falls National Park. The veterinarian leaned out the Land Cruiser’s passenger-side window, a tranquilizer gun propped on his shoulder. 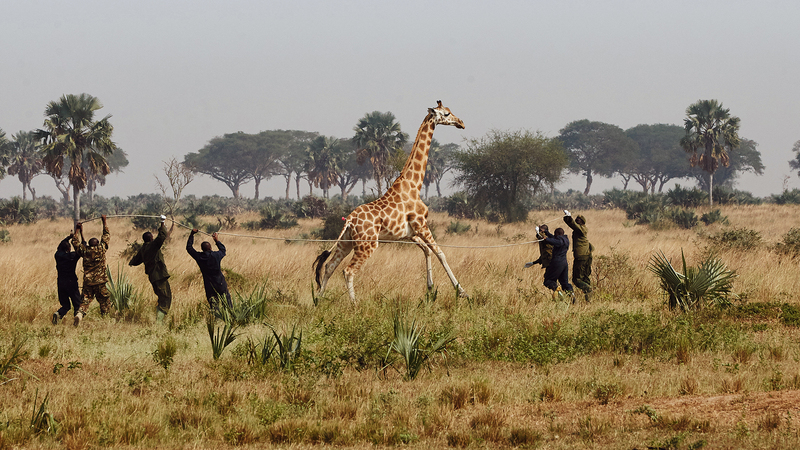 After eyeing a herd of giraffes, he leveled the rifle and took a shot. Suddenly, two of the animals broke into a clumsily elegant lope until one, with a dart’s pink faux feathers visible in its haunch, slowed. A team of park rangers jumped out of another vehicle and ran toward the groggy yet spooked giraffe. They slung a rope around its chest, then crossed the rope behind the animal’s sloping back. The giraffe dragged the men along for a few seconds before it wobbled and came crashing down, Gulliver laid low by Lilliputians. A group of scientists and vets sprinted toward the animal, through the tall grass of Uganda’s Murchison Falls National Park. Despite a heavy dose of tranquilizer, the 2,000-pound male wasn’t out cold. Four men leaned on his torso to hold him down. 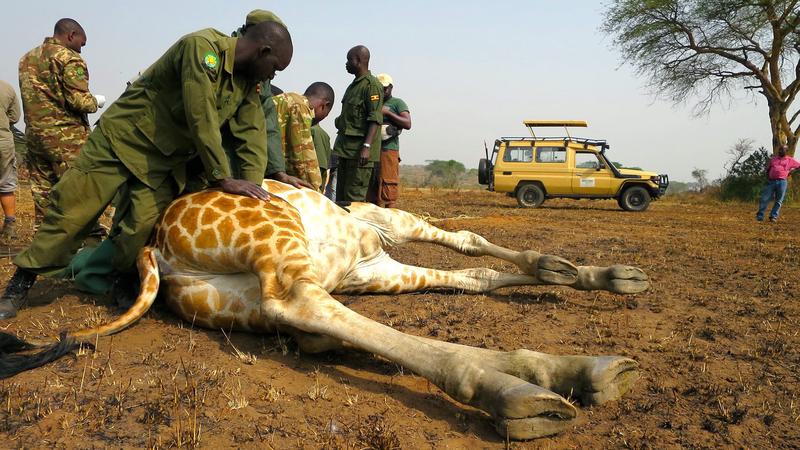 Others skittered about, measuring every body part, taking the giraffe’s temperature, and drawing blood samples. Timing was crucial. Given a giraffe’s complicated physiology—for one thing, getting blood to its extremities requires exceptionally high blood pressure—it was important to minimize its time on the ground. Additionally, a near-lethal dose of anesthesia is necessary to ensure giraffes go down quickly instead of running off and injuring themselves. The team had 20 minutes to administer the tranquilizer’s antidote, or the patient might never wake up. It was early afternoon on a warm January day in Uganda’s largest national park, a 1,500-square-mile idyll of grasslands, forests, and hills, bisected by the Victoria Nile and teeming with wildlife—a casual drive through might yield sightings of elephants, hippos, kob, oribi, buffalo, warthogs, baboons, monkeys, and countless birds. 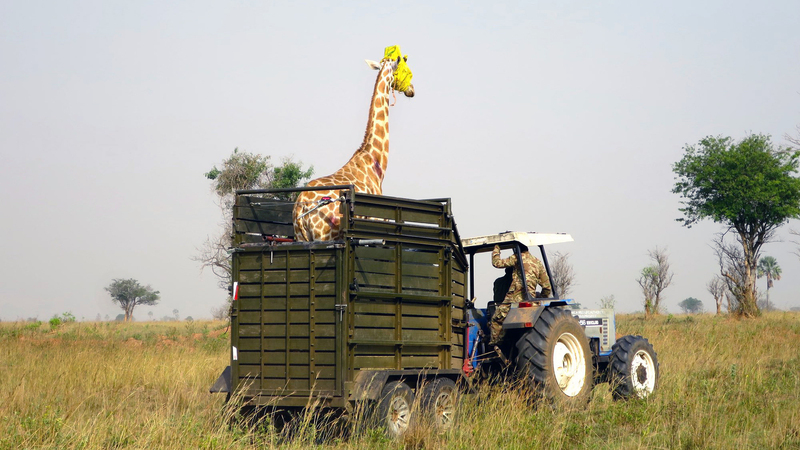 Fennessy and his team were there to help the Uganda Wildlife Authority (UWA) with a unique translocation of 20 rare giraffes from the section of the park north of the river, where they are under growing threat from oil drilling and poaching, to its more removed southern sector. Fennessy and his wife, Stephanie, who cofounded and helps run GCF, had been coordinating with the UWA for more than a year on what they dubbed Operation Twiga, using the Swahili word for giraffe. This afternoon’s capture was the 17th in nearly two weeks, and the team had clearly honed their wrangling process. The giraffe on the ground bucked, blowing massive bursts of hot breath from his nostrils as the rangers fitted a yellow sugar sack over his head as an improvised blindfold. Then they threaded a rope around his chest and gathered around him the animal in a loose circle, with teams of men on each end of the rope. One ranger held a rope around the giraffe’s neck, like a leash. In the center, Fennessy stood over his haunch and slapped it three times. “Heya! Come on, get up!” No response. Fennessy leaned in, grabbed the animal’s long, thin tail with one hand, and bit down. Suddenly, the giraffe snapped to life and struggled to his feet. He spun left, thrashing his head, then spun right, as the rope handlers hustled to guide him forward into a four-foot-wide trailer nearby. The man holding the neck leash reeled the giraffe in while others closed the gate behind him. The awkward dance was over. 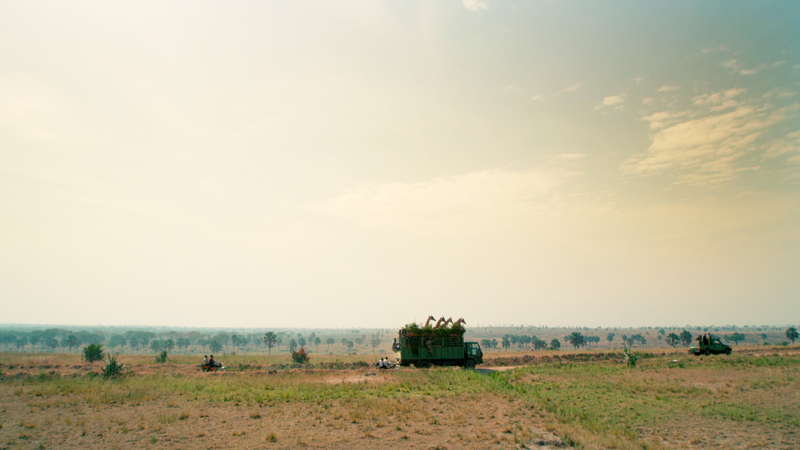 Once the boma held six or seven giraffes, the team would load them into a large truck, which then slowly rolled down the park’s dirt roads to an area called Paraa, where a ferry would float the truck across the river. Another road trip would then bring the giraffes to their new home, roughly in the center of the park’s southern zone. Murchison Falls is the last remaining stronghold for one of the most endangered of the nine giraffe subspecies, the Rothschild’s giraffe—distinguished by its cream-colored background coat and the absence of spots on its lower legs, giving it the appearance of wearing white knee socks. Perhaps 1,500 Rothschild’s giraffes remain in the wild, of which 1,250 live north of the river in Murchison Falls. Unfortunately for the Rothchild’s, this area is also where poaching has been greatest in the park and where the bulk of future oil production is expected to occur. The goal of Operation Twiga’s artificial migration, tail biting and all, is to create a giraffe insurance policy by taking advantage of one fact: Giraffes don’t swim. Once south of the river, the transplants would stay there. “The idea is to set up a satellite population for security in an area of the park where, historically, we assume they were at one time,” Fennessy says. Fennessy himself seems most at home in the field. He buzzes around with the energy and athleticism of a former rugby player, occasionally clambering up the side of the boma or breaking into a full sprint to catch up with a running giraffe. Okello, 50, is both a “man of the ground” and a polished bureaucrat, his camouflage uniform always seemingly freshly pressed. He is as comfortable talking about SWOT analysis as elephant behavior, and he is justifiably proud that Murchison Falls has become a crown jewel of the Ugandan parks system. Its namesake waterfalls and abundant wildlife draw more than 70,000 tourists annually, a number that’s grown every year for the past decade. But it hasn’t always been this way. Elephant numbers plummeted from an estimated 14,500 in the late 1960s to about 1,400 in 1980. By 1990 there were perhaps a mere 250 elephants in the entire park. Buffalo dropped from an estimated 26,500 individuals to fewer than 1,000 over that same period. Lions nearly vanished from Murchison Falls altogether. Giraffes and other animals fared no better. 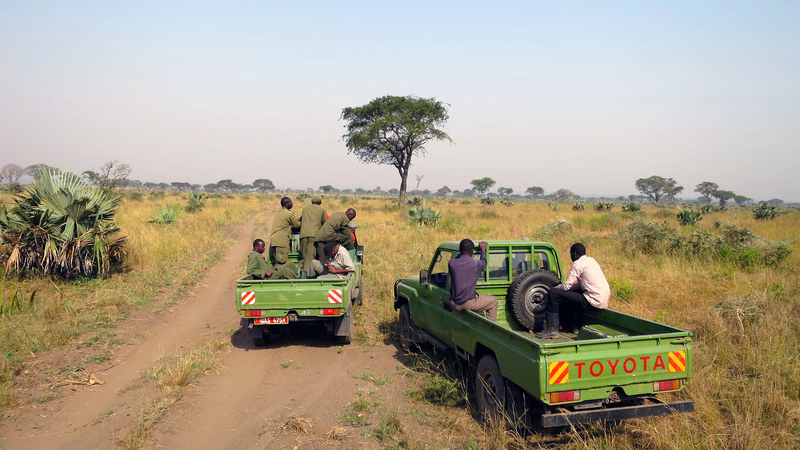 Shortly after Uganda created its wildlife authority in 1996, the National Army ousted the rebels from Murchison Falls. The park’s megafauna slowly rebounded, with recent surveys putting the buffalo population at almost 10,000 and elephants at around 1,520. The relative peace has allowed crucial conservation work to resume and people to return to long-abandoned villages, but it has also brought new challenges. Continuing political troubles in neighboring countries, especially in the Democratic Republic of the Congo to the park’s west, ensure a steady flow of refugees. 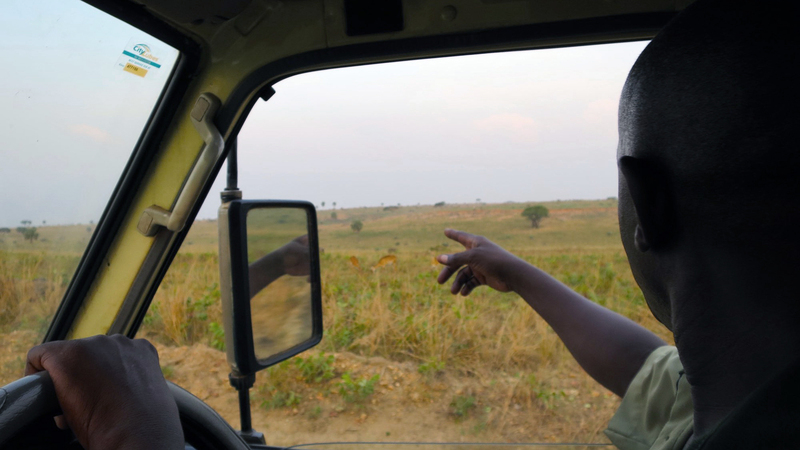 According to Okello, such population pressure, combined with poverty, has led to a resurgence in poaching, particularly in the north, which is closer to the commercial hub of Pakwach and just a short paddle across the river from the DRC. “I will show you just how bad it is,” says Okello. Walking to a row of storage sheds a few hundred yards from his office, he swings open one door and then another, revealing rooms piled to the ceiling with rusting metal, homemade traps, and weapons that his rangers have collected over the past two years. Massive, spring-loaded bear traps made from old car parts sit alongside crude, rebar-tipped spears. But the majority of the stash is made up of the simplest and most nefarious tool of all: wire snares. Total’s base for oil operations, just off the paved road north of the park, is a massive, fenced-in lot with a warehouse building, shipping containers, and row upon row of stacked drill pipes and casings. It sits idle for now, but it’s a reminder of what is to come. Since the 1920s, the Albertine Rift valley, which sits at the northern end of Murchison, has been thought to contain oil reserves—a hunch that was confirmed when oil exploration began in 2006. Albertine deposits are now estimated to hold 6.5 billion barrels of oil, of which about 1.5 billion barrels is expected to be recoverable. Starting in 2010, under a memorandum of understanding with the Ugandan government, Total began conducting seismic studies and drilling 27 exploratory wells in the park. When the exploration phase wrapped up in 2013, Total estimated that up to two billion total barrels sit beneath the Murchison Falls delta area and that 42 percent of its reserves lie beneath the park. A combination of plunging global oil prices and foot dragging by the Ugandan government has so far stalled production, but over the past year, the necessary pieces have begun falling into place. In April, the government announced plans for a 1,000-mile pipeline, funded by Total and other oil companies, that would send crude oil from Uganda across Tanzania to the port of Tanga on the Indian Ocean. Then in August, Uganda took a major step forward in granting eight production licenses, including three to Total for Exploration Area 1, which includes Murchison Falls. Total has 18 months to make a final funding decision on its multibillion-dollar investment in Ugandan oil, but most observers expect the company to move forward, with environmental studies and other preparations commencing in 2017. Actual oil production would begin in 2020 at the earliest and last for 25 years. If the wildlife goes away, so will the tourists. The oil sector is expected to account for 3 percent to 9 percent of Uganda’s GDP once it’s up and running, but according to estimates by the Uganda’s Ministry of Tourism, the tourism sector just about matches that and is growing by roughly 6 percent annually. And while the oil is expected to flow for 25 years, tourism could be an economic driver that sticks around. Okello, who is preparing park staff and setting up guidelines for the oil companies, is more optimistic. “This is a big company that wants to protect its name, so we think they are going to manage the impacts to the minimum,” he says. Total is also paying for additional rangers and funding full-scale environmental studies of the kind rarely undertaken in Murchison. Still, even the most conscientious extraction scheme comes with risk, a fact implicit in Operation Twiga’s very premise. 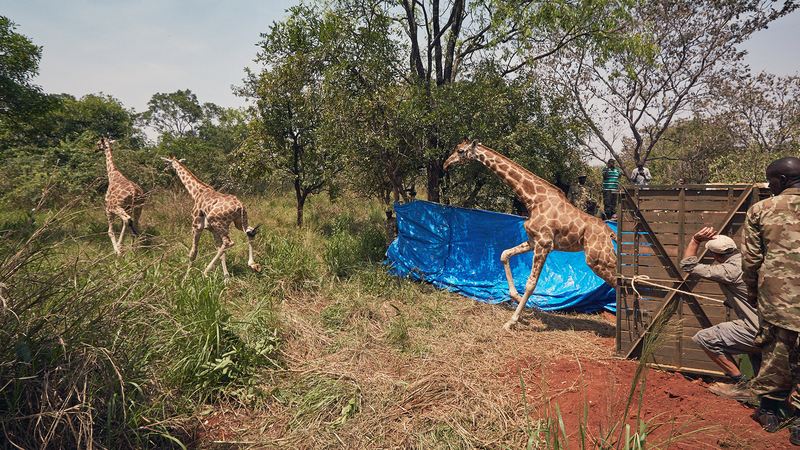 “The next activity will be the production phase, which may be even more intensive than the exploration phase,” Okello acknowledges, “so really what we are looking at is that you should not keep all your eggs in one basket.” Or, in this case, all your giraffes on one side of the river. 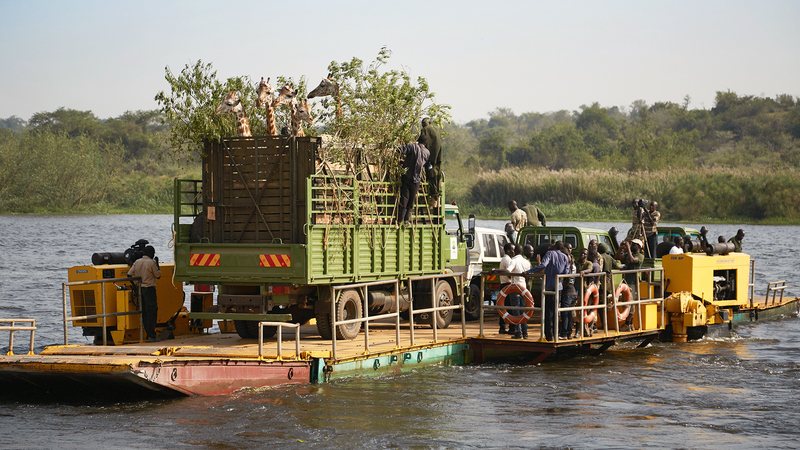 A half-dozen giraffes drifting across the Victoria Nile in a makeshift ark is a unique sight: standing in the back of a large truck atop a barge, their long necks protruding high over the side, affording them a commanding view of the river, the hippos swimming in it, the elephants along its bank, and the humans and vehicles clustered aboard the ferry with them. They stomped and shuffled and pushed up against the walls of their pen, turning their long faces from side to side, implacable but silent and vaguely cartoonish. They were clearly anxious. Notwithstanding the caravan’s comical appearance, getting giraffes into a truck and onto a ferry is hard work, and not without risk. Just that morning, one giraffe—a small and particularly charismatic male that the Fennessy children named Melman, after a character in Madagascar—fell while being loaded onto the truck. Fennessy sprinted around the corral to help, and luckily, Melman was back on his feet quickly, but the accident underscored the dangers. The giraffes were unsettled and exhausted, and if one fell, it could be trampled by its freaked-out companions. As the truck rolled off the ferry on the south bank of the river, tourists snapped photos of the odd convoy from their safari vehicles. 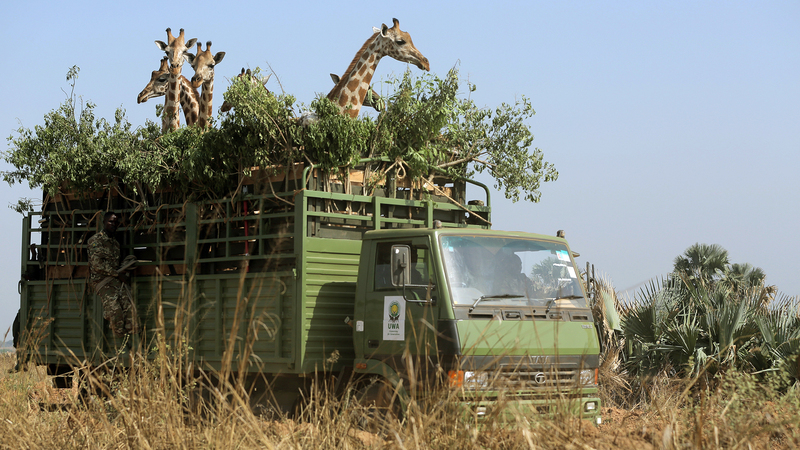 The Fennessys and several rangers drove ahead to trim overhanging foliage that might hit the giraffes in the head, while the rest of the trucks crawled along with the giraffes at about 10 miles per hour. During the first transport the prior week, the giraffes had arrived agitated after riding too fast on Murchison’s bumpy dirt roads, so the driver was extra cautious this time around. Covering the 25 miles to the release point took two hours. Finally the precious cargo made it to its destination. Here the land has more hills and the forests are more dense than in the relatively wide-open north, but there’s no reason its newest herd wouldn’t be able to adjust. The truck backed up to an earthen ramp that had been dug out of the red dirt at the roadside. Then the entire team of park rangers, veterinarians, volunteers, and journalists created a sort of human funnel, as though waiting for a football team to rush out onto the field. The gate opened. Nothing. For a long 30 seconds, the animals stood nearly motionless. After some prodding, Melman finally walked down the ramp, and the others followed quickly. The six giraffes loped off into the forest in a single file, moving briskly and fluidly, nearly smashing the BBC crew’s GoPro as they ran off. They disappeared into the trees in a matter of seconds. For more information on the Giraffe Conservation Foundation, visit its website. The U.S. premiere of Giraffes: Africa’s Gentle Giants airs on PBS on October 26. Peaceful coexistence will be the key to a wildlife corridor for jaguars spanning 10 countries across the Americas.